You know that familiar scenario, you buy an umbrella and you get the cheap one from the shop and it blows inside out and eventually breaks. And you go through several umbrellas like this costing you a small fortune. Well, no more! The GustBuster is the best windproof umbrella on the market and we are not just saying that. You will never buy another umbrella again. Best windproof golf umbrella: Proven! The GustBuster is proven to be the best windproof golf umbrella. It has been tested by the US College of Aeronautics to withstand winds up to 55mph. It has also undergone rigorous testing with several other independent testers. Check out our post on the RandomRazr Youtube channel for an example of this. You can see loads of other videos if you search GustBuster on Youtube (someone even ties one to the back of their car!). We were delighted to be shortlisted for the MYGOLFSPY Best Umbrella category in 2017. Then to win 3 out 5 of their categories and to be awarded the overall Best Buy golf umbrella 2017 was fantastic. 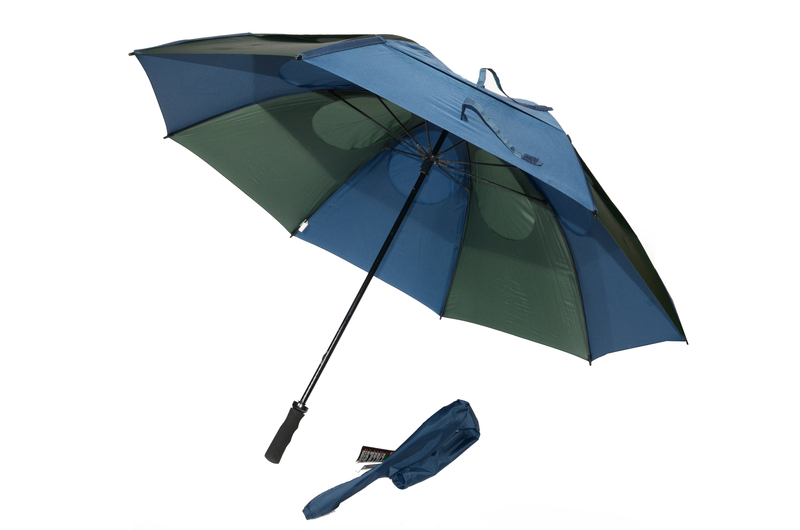 You can find out more about the best golf umbrella award on our blog here. What makes the best windproof golf umbrella? GustBuster umbrellas have a patented windproof design using the highest quality materials. The combination of design, materials and care make the GustBuster unflippable, unflappable and unleakable. Every style of GustBuster umbrella has the same windproof design and uses the highest quality materials. Find out more about the design features of the umbrella. We are so proud of this we have given each and every GustBuster umbrella a lifetime guarantee. So view the range, view our printing options and get yourself the best windproof golf umbrella out there. You will never need to buy another umbrella. Unless you leave it down the pub. The GustBuster windproof golf umbrella is stated to be unflippable, unflappable and unleakable. These are some hefty claims for an umbrella, however they are completely justified, tried and tested. The superior design and high quality components mean it has won MYGOLFSPY best golf umbrella in 2017 and 2018. So you can be assured that the GustBuster windproof umbrella is a great investment. No wonder it is the No1 golf umbrella among many PGA tourers. Even the Duke and Duchess of Cambridge have been seen stepping out with a GustBuster golf umbrella. The GustBuster golf umbrella has been tested by the US College of Aeronautics to withstand winds of up to 55mph. This is due to the double canopy layering and the innovative teardrop shaped wind-release vents. The elastic shock-cord uses the patented wind pressure release expansion cord system, which works with the wind to avoid any annoying flipping inside out when you need your umbrella the most. Your GustBuster golf umbrella has been made with a sturdy and lightweight design. 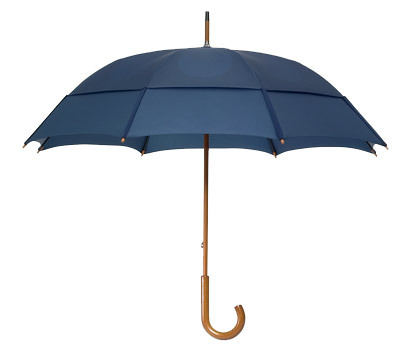 The fibreglass shaft ensures that the umbrella is lightweight and strong. The shaft & runner have exclusive Memory Rod® Construction so it won’t crimp, rust or bend out of shape. The Proprietary Flexor Ribs™ sit in the canopy and spring back to their original shape. The protective ferrule is injection-molded and so can withstand high impacts and is designed to fit into the smallest of golf bags. The GustBuster golf umbrella canopy is made from the highest quality 190 thread count nylon. This will ensure that you do not get wet! It also means that it is bleed and fade proof so your GustBuster golf umbrella will remain in tip top condition. 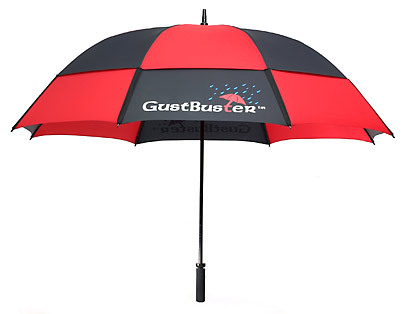 The best thing about the GustBuster golf umbrella technology is that it is used across the entire GustBuster range. So if you prefer the nifty Metro umbrella or the stylish Classic umbrella you will still get the unflippable, unflappable and unleakable technology. Why not take a look at the SunBLOK umbrella with added UVA and UVB filters. View the entire range here.